Attila Égerházi, founder and band leader of Djabe has a friendship of 20 years with Steve Hackett, guitar player of Genesis. Their first musical cooperation took place in 2003 when working on Djabe: Sheafs Are Dancing album. The first joint gig happened in summer 2004, in the Spitz Club, London. In 2007 Steve helped in filling the Petőfi Csarnok venue in Budapest, at the memorial concert for András Sipos. Hackett was greatly influenced by Djabe’s musical spirituality, openness and playing style that finally he himself asked to continue this joint adventure. 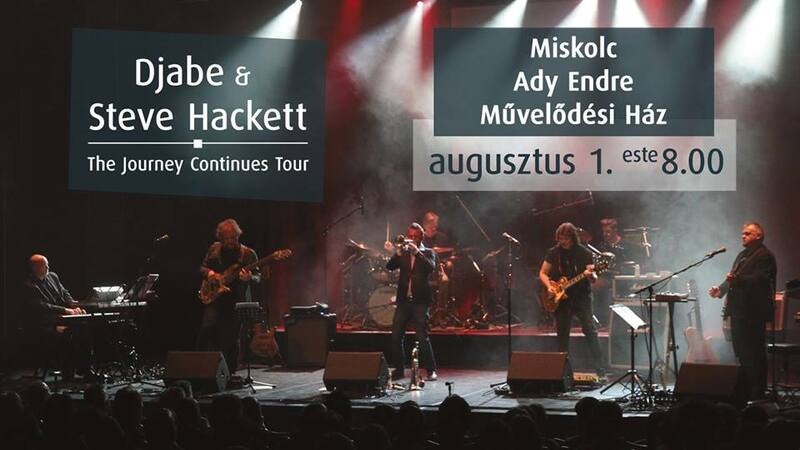 Every year since 2008, Hackett and Djabe joins for a tour, featuring Djabe, Steve Hackett and Genesis pieces. Steve Hackett was featured on 6 joint albums with the band since 2011. The last 3 of these released under Cherry Red Records’s Esoteric Antenna label. Thanks to Cherry Red these albums are globally available and sold in the thousands. Besides these joint albums, Steve frequently features as a guest star on Djabe’s albums, while Djabe musicians participate on numerous recordings of Hackett. Life Is A Journey – The Sardinia Tapes, recorded on the island of Sardinia (unique in its sounding and instrumental-progressive genre) brought great success to the Djabe & Steve Hackett formation. This album was born after 3 days together in the island, doing impros, when Tamás Barabás (bass player of Djabe) made it into a full-length studio album. Both Steve and all Djabe members found his work amazing, and Life Is A Journey – The Sardinia Tapes released globally on 4 October 2017, followed by a premiere gig in Budapest. The recordings of latter gig served as basis for Life Is A Journey – The Budapest Live Tapes, released on 12 September 2018. The DVD version features a video documentary with recordings of the concert: Tour Is A Journey. The journey continues in 2019: Steve Hackett and Djabe once again will be on tour in July-August.